Okay, did anyone actually read the title-text? Just because a lot of people seem to be saying "X should be ticked because people in power fall for the woomeisters' claims!" Hell, you don't need to get even as esoteric as semiconductor design. Precision magnets rely on quantum electrodynamics, don't they? Also, wasn't Shibbolet (instead of "Shibboleth") the one that would get you executed? Or was that "Sibbolet(h)"? "It doesn't really matter / you better play guitar yourself / no, it doesn't really matter / DNF will soon be on the shelf." Don't take the Axiom of Choice? You won't tell me how to carve my pumpkins, Andrew Schafley! You know, this almost seems like officially bookending his "reign," like an acknowledgment that the "RANDALL GET OUT OF MY HEAD" days are over. Does anyone else get that (almost certainly unintended) feeling? ...instead, they just do predictable situational humor and slapstick. Not sure this is the best source. And as I-can't-remember-who-but-I-remember-thinking-how-appropriate-it-was-to-his-career said, "it's not who does it first, it's who does it second." Congratulations. You've A: Given millions of your lower bracket of readers ideas (which they'll just use to make money, of course), B: Established Black-Hat-Foil as ignorant of a basic computer security measure. The XKCDsucks gang is going to have a field day with this one... not because it's bad, but because there are just so many ways to make fun of it. It's like "this is your brain on drugs" in webcomic form. Who said anything about self-replicating? And the way I remember it, "life" has to meet a rather narrow definition of "self-replicating." Never mind that - they were humming the Star Wars theme in 1973? 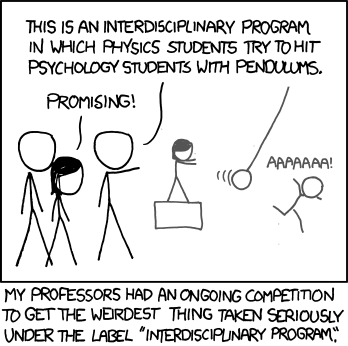 Topic: 0179: "E to the Pi times I"
Alt-text: "Replace the pendulums with history students and you'll qualify for a grant!" I fantasize about this course every time I hear the word "culture" from a humanities student. ...perfect. Just perfect. When I was that close to joining the dark side, Randall pulls through. ...holy crap, the real joke just occurred to me. Wiki + encyclopedia... dammit. I'm an idiot. ...well, the alt-text was stupid. Ish, maybe.